The most sacred shrine of Lord Vishnu, Badrinath is one of the Char Dhams of Uttarakhand state and also the Chardhams of India. Accommodation in GMVN Badrinath Tourist Rest House is provided in Economy Class. The rooms at Badrinath TRH provide comfortable accommodation at affordable price. Badrinath is situated at an elevation of 3,133mts above sea level in Chamoli district of Uttarakhand state. The GMVN Badrinath TRH is situated in the town of Badrinath. The GMVN Badrinath TRH provides clean and comfortable accommodation in budget price. 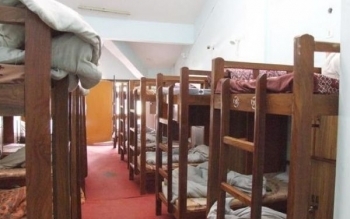 There are economic rooms and dormitory with basic amenities like bathroom, hot water and clean bed. The restaurant in the GMVN TRH Badrinath serves pure vegetarian delicious food. The hotel is 336 km from the Jolly Grant airport in Dehradun whereas Rishikesh railway station is located at a distance of about 316 km from the hotel. The hotel is just 500 metres away from Badrinath bus stand and it is well connected by bus services with Rishikesh, Haridwar, Dehradun and Kotdwar. The hotel is 3 km away from Mana Caves, Ganesh caves, Vyas Caves, Bheem Pul and it is Â½ km away from Badrinath Vishal Mandir.